The other day I was out doing some shopping and the color mint was popping up all over the place. I found my self really liking it though fortunately I controlled myself and only came home with one mint top. Can't say I won't be adding any more though! What do you think of this color trend? Love this color for spring/summer....but I definitely need to work on my tan a bit before I can wear any fabulous mint-colored attire! 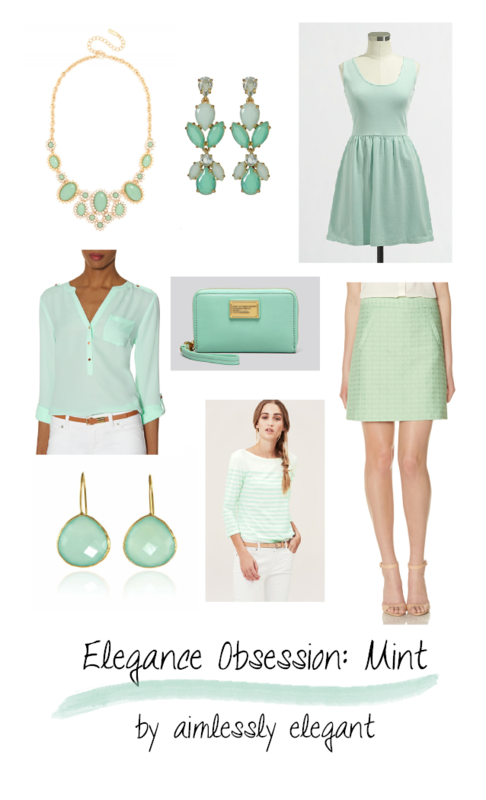 Love the mint blouse and I really like a nice mint polish!! I am ALL about the mint these days! These are great picks - I love the striped top. I also have been trying to get my hands on a pair of mint skinny jeans. I'm with you on the mint!! Very fresh and romantic! I hear you! I am in desperate need of a tan! That's funny, right as I published this I thought that is exactly what I left off, a nice mint polish! I found a great pair of mint skinny jeans last year at NY&Co. I was searching for a pair for this post, but didn't come across anything great. Good luck with the search!